MAC offers a robust, flexible wireless solution platform solution that supports web based applications for monitoring and controlling sensor networks and wireless embedded devices. 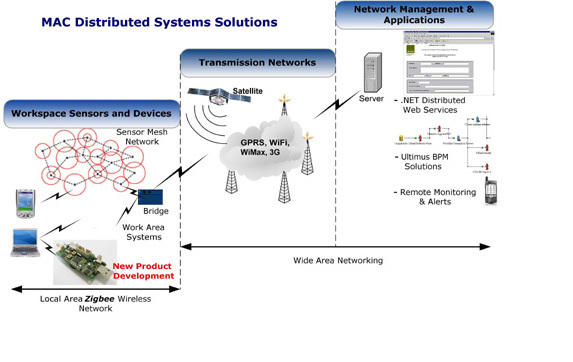 The platform solution addresses the market requirements for the real-time management of wireless networks, and is cost effective , robust, and a highly scalable and flexible solution. Monitor and Control sensor data at the point of work, such as utilities, environment and shop floor/supply chain, using intelligent low cost, low power single chip or dual chip zigbee wireless platforms. Communicates this data through the use of both fixed and wireless communications, such as WiFi, WiMax, Ethernet, GSM, GPRS, CDMA, Satellite & 3G. Processes and Distributes this information for critical decision making using the .NET Framework, that includes a range of dBase options and automatic reporting techniques such as Microsoft Reporting Services. Our Distributed Solution is based on open and approved standards and platforms, such as Zigbee and .NET as opposed to proprietary solution, ensuring product reliability, industry compatibility and standards compliance. MAC’s partnership with Ember Corporation, who is a key promoter of the ZigBee Alliance, ensures that MAC clients can have an early role in the mass adoption of cost effective, low power, mesh networking technology for monitoring and control applications, based on an open global standard. This distributed solution will enable rapidly web-enable your existing product or service and is already proven in the harsh power utility sector for network monitoring as well as the environment sector for water quality monitoring.